Have you visited the Ballard Tool Library yet? Stop on by during our open hours, look around, ask questions of the volunteer librarian and see if the Ballard Tool Library is something you might use! Come visit us during open hours, sign our waiver and you can start borrowing tools right away! You’ll need an annual membership to Sustainable Ballard ($35 Individual, $60 Household, or $100 Sustaining). Then make a small donation of $1-$10 per tool per week. Low to no cost options are available for those with limited income. 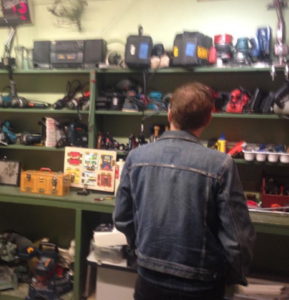 Set up your tool library membership now. What kinds of tools does the BTL have? Whatever you need! We use a very loose definition of “tool,” therefore our members can expect to find the usual drills, saws, etc. as well as sewing machines, juicers, canopies, lawn aerators, and many other dealy-bobs and whatchamacallits! Our aim is to maintain a collection that represents Ballard artists, craftspeople, gardeners, mariners, and putterers. Are you looking for a specific dealy-bob or whatchamacallit? Let us know and we’ll try to get it. Stop on by and say “hi” — we’d love to get to know you!